After that, I headed to Akiyoshi-dai. I got off the bus at a closed tourist information centre and once again wondered what I’d gotten myself into. Fortunately, there was a map with the hostel indicated (labeled in Japanese, but Lonely Planet helpfully includes Japanese writing for most place and business names.) I’m now at the hostel in a huge 11-tatami room (yes, it’s a unit of area here.) There were 5 futon in the closet but there’s just me… not just in this room but in the whole place! Travelling in the offseason is weird. This isn’t the first time I’m alone in a hotel or hostel (Kagoshima and Kumamoto were also that way) but definitely my first time being alone in such a big place. Some places are still full of tourists and travellers though. The hostels in Kyoto and Osaka were all full or close to full every night, and some places like Aso-san were full of Japanese tourists. I never know what to expect when I arrive somewhere! Tomorrow: exploring the Akiyoshi-do cave then bus->local train->shinkansen. 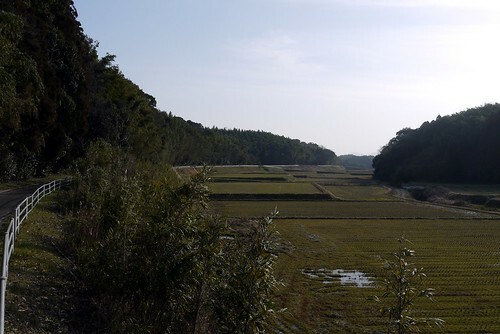 Possibly cycling the Kibi Plain before heading to Osaka. If I don’t have time, it’s straight to Osaka. I’m spending Thursday and Friday nights there before heading back to Tokyo on Saturday. Usuki was great. 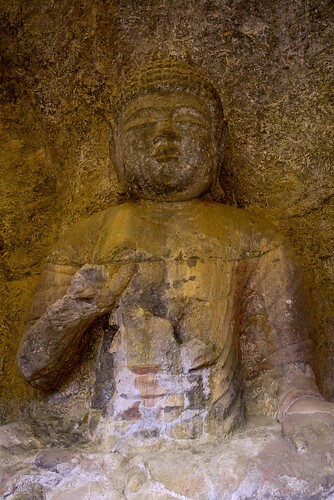 The stone Buddhas are worth a side trip if you’re ever nearby. One of them looked like he may open his eyes at any moment and say something. Not sure I’d understand a 1000 year old dialect of Japanese though so it’s just as well that he didn’t. Is Usuki worth a side trip in the pouring rain on a borrowed bicycle with a lousy umbrella? Yes, if you’re me and therefore crazy. 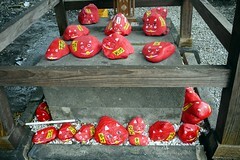 I also stopped at a shrine that I’ll call the Red Cat Shrine on the way. 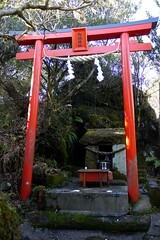 There was no English information, but my guess is that it enshrines a spirit that takes the form of a red cat. I’m now on the Sonic Limited Express. It’s a funny train, modern and sleek but some of the design clearly dates from the early 90s and has not aged well. It still works, it just looks a bit dated. 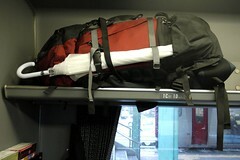 Like many trains on Kyushu (and most shinkansen), it has no clear front or back. The front is where the driver is sitting. On this service, it changed directions about halfway along its run, so everyone got up and rotated their seats to face the front again. I’m on a trainset called the Hyper Saloon Inter City. Later today I’m taking the Sonic Limited Express 40. Japan has the best train names evar. Also the best trains, hands down (sorry Germany and France.) The only downside I’ve found (apart from the cost if you don’t have a Japan Railpass) is that there usually isn’t very much food available: cold lunchboxes and lousy sandwiches if you’re lucky. Oh well, I’m capable of feeding myself on trains. It was raining in Beppu yesterday and I was going to be wandering a bit so I finally bought an umbrella. It cost 420, which is actually expensive for a disposable-quality umbrella. Beppu was great. It’s the hotspring (onsen) capital of Japan. Just what I needed after a few days of outdoor adventures: onsen, onsen, onsen. I put in a load of laundry and went to Ekimae Koto, a small local spa (I was alone, which was nice.) Then I went to a Kitahama Onsen Termas, a large oceanside spa with an outdoor tub offering mixed bathing (rare) with bathing suits. Ate lunch at the train station and got a hand drawn map for Tsuru-no yu, a free onsen dug and maintained by the locals. 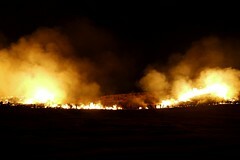 Sadly it’s either dried up or stopped for the winter. There was only 10cm of tepid water in the bottom. (Must email Lonely Planet about this…) It wasn’t a wasted trip though; I visited Onsen Hoyoland, a mud bath in the same area. Mud bathing is interesting and I’m glad I went but it’s not an experience I’d seek out again. Back to downtown Beppu for dinner and 2 more baths: the public bath at my hotel, and a private bath (also at the hotel, by reservation.) The private bath was nice because I could do things I don’t normally get to do at an onsen like… add cold water without asking! This morning I visited Takegawara Onsen, which is in an old Meiji-era bathhouse. It was worth the visit just to bathe in such a nice building with gorgeous wood ceilings instead of tile. They also have an artificial sandbath (Ibusuki is the only natural sandbath in the world) that I used. It’s not the same – mainly, the steam that comes through the sand isn’t hot enough. Oh well. 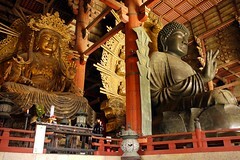 I’m now heading to Usuki to see some stone Buddhas. It’s still raining, so the umbrella is coming too. Onwards from Sakurajima: I took the train from Kagoshima to Kumamoto and spent the evening in town. Historically, that’s an interesting combination because of Saigo Takamori. He was an important figure in the Meiji Restoration, during which Japan restored contact with the rest of the world and consolidated government power under the emperor as a constitutional monarchy (same system as Canada, more or less.) But then he unsuccessfully led Japan’s last civil war agaist the government he helped found and ended up committing sepuku. Nevertheless, he is mostly revered in Kagoshima. 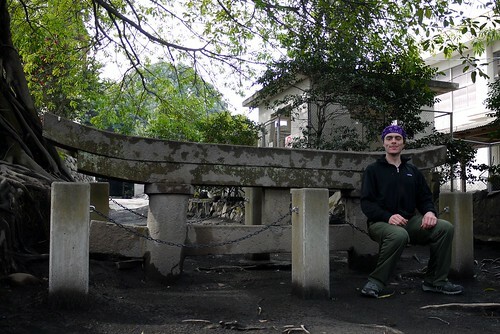 Not so much in Kumamoto – the castle there is the one he burned down as part of the rebellion! Anyway, an interesting figure and I now want to see The Last Samurai, a movie (based on or about?) his life. My purpose in Kumamoto was to rent another bike and ride north to the onsen (hotspring) town of Yamaga along a cycling path. This was an excellent ride with gentle hills mostly through farmland. The only unfortunate part was I only had time to visit one onsen while in Yamaga. The spa facility wasn’t that great but the water was wonderful! After Kumamoto I was thinking of heading to Kirishima-Yaku National Park, but after a few phone calls decided that this would be too difficult and risky (in terms of not finding a place to sleep) in the off season. 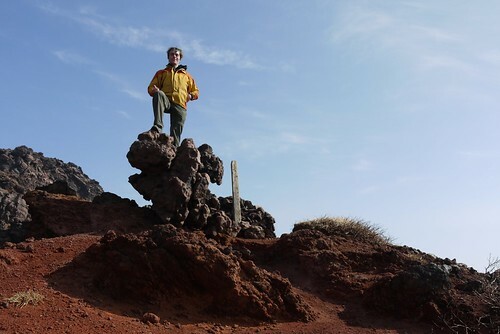 I’d like to go at some point and climb a few more volcanoes, but during the summer with a tent and maybe a bicycle. 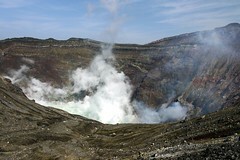 Instead I took the train to Aso, another active volcano. I took the bus up part of the mountain, climbed a minor hill near the volcano museum, ate lunch, then waited. This active volcano vents sulphur dioxide, a poisonous gas, so parts are occasionally closed for days or hours. Fortunately, I only had to wait about 40 minutes before they gave the all clear and let busloads of tourists (and me) ascend to the viewing area where you can see the active Nakadake crater. But then more waiting: one of the areas I wanted to hike through was closed! I eventually asked one of the rangers if there was anything I could do and he outlined a route on my map that avoided the closed area and pointed me at it. So that was fine and off I went. 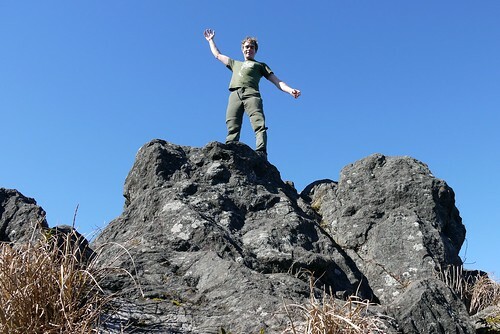 I ended up climbing two peaks: Nakadake and Takodake. It was a really fun and scenic climb. 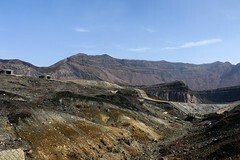 The only bad part was hiking through the sulphur dioxide field. 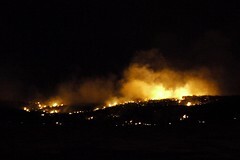 It was apparently weak enough to be considered “safe” even by the cautious Japanese authorities, but it wasn’t _pleasant_ to breathe. That was only 15 minutes or so of the hike but enough to give me a really runny nose for the rest of the day. After the climbing I just had time to soak and sauna at Yume-no-yu, the local onsen, before getting on a train for Beppu. All in all another great day but I’m looking forward to some relaxation in Beppu. The next morning it was raining and I was hung over, so I borrowed an umbrella, bought some coffee from the vending machine, and went back to bed for a few hours. After that, I went to the train station and rented a bike. JR have managed to make renting bikes more complicated than renting cars in most of the rest of the world. First, you need to visit the train station’s reservation office and pay for a piece of paper that looks like a train ticket. Let’s call it a bike ticket. It has the pickup and drop off times on it – you have to decide in advance how long you’re keeping the bike for. Then you need to find the car rental counter, go there, and they’ll lead you out to the parking lot and give you a bike. The most annoying part is the counter closes at 17:00 in Kagoshima, so you can’t keep the bike any later than that. Oh well. My goal in Kagoshima was to take the ferry out to Sakurajima, the island/active volcano across the harbour, and ride around it, visiting the sights on the way. Unfortunately, I was late enough that I didn’t have time to do much sightseeing if I wanted to ride all the way around. I stopped for 10 minutes in a lava field, which was cool. I expected a smooth flow but it turns out the cooling process makes it break up into chunks. Very neat. At the halfway point, I took a photo at the buried torii – a shirne gate that was buried by the 1914 eruption of Sakurajima. So not many photos but it was a nice ride. Sakurajima is an interesting volcano. It occasionally dumps ash on Kagoshima but it’s mostly harmless. They’ve built some concrete eruption shelters just in case and you can see lava canals on the way around the island. They got a few days’ warning (wells boiled, the ocean turned purple) before it erupted in 1914 so nobody’s worried about it doing anything sudden. One odd thing was how unfriendly the locals on Sakurajima seemed. Reactions to foreigeners so far seem to be indifference (Tokyo), welcome (Kagoshima), or surprise (Kishigawa.) 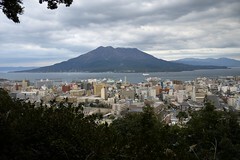 On Sakurajima it seemed to be more of a hostile indifference. Oh well. Not everyone has to like me. It was just a big change from Kagoshima, which is just across the harbour and everyone is super friendly. On my last night in Kagoshima, I decided to try imo-jochu, a local specialty. I walked out of the place I was staying and went about half a block to the first orange lantern. Orange lanterns can mean many things in Japan but usually they mean an izakaya, which is a traditional Japanese pub. There were two groups of Japanese people at the bar when I arrived and the bartender offered me the only seat left, right between them. I ordered the drink and she mixed it: about 1 part of a clear alcoholic drink, about 25% abv, and 2 parts hot water. I looked around – this was a small, local pub, the kind of place where you can buy a bottle of imo-jochu, stick a cell phone charm over the top, and they’ll keep it on a shelf for when you return. The group to my right asked me where I was from, and we started talking. They were 3 from the Japan Meterological Agency in Nagasaki, visiting Kagoshima on business. Like me they had decided to sample the local beverage, and when my glass was empty, they refilled it from their bottle. After several drinks, their bottle was empty and they said goodbye, but not without telling me of their favourite pub in Nagasaki that I now plan on visiting. Then the group to my left started talking to me. They were 3 locals – the man furthest to my left was the owner of the bar, and the bartender was his wife. She pulled out a DVD and put it on – it was a TV advertisement for imo-jochu featuring both of them! This time, when my glass was empty, one of the other locals refilled it from his bottle. He suggested I try it on ice but I decided not to switch horsemen in the middle of this apocalypse. He also introduced me to the third local – a girl of 25. He said she was a very nice Japanese girl. I told them I already had a girlfriend, in Canada. He asked me if she was a good girlfriend, and when I said yes, they left it at that. I told the girl she was very cute, which may have been true or it may have been the imo-jochu. Finally, it was closing time. I grabbed 2 bottles of a sports drink from the vending machine and drank them on the way home. It was late enough that the door was locked so I got to use the secret entrance into the inn, which… well, it’s a secret. I climbed Kaimon Dake. 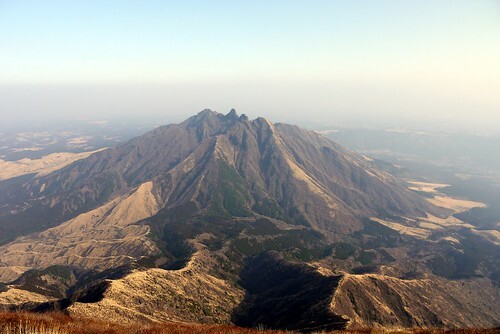 It was a far more strenuous climb than Kibune and Kurama, but worth it for the views and the simple joy of climbing. There’s only one reason for most people to go to Ibusuki: the sandbath – the only natural one in the world. There’s a section of sand along the beach that’s heated by volcanic steam. 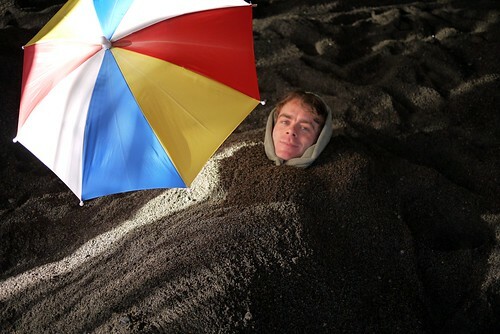 You can get buried in the hot sand and lie there for as long as you like. It feels about how you’d think, if you’ve ever thought about that. They only recommend staying in for 15 minutes but you can go as many times as you like (as long as you have 900 yen in hand.) I went yesterday evening after dinner and also this morning. They’ve thought through the details, as usual – you’re lent a yukata (cotton robe) to wear as part of the price, and they take it back and clean it when you’re done. If you go during the day and it’s sunny, they put up a little umbrella over your head for shade. If you bring a camera, the burial ladies will even take your photo and then tie your camera into a plastic bag to keep it clean and dry! All in all, a great experience for someone who likes hotsprings. As it turns out, I do. And I now know how a baked potato feels. I stayed at the Minshuku Marutomi (Maritime Inn.) It’s a small, 7 room place about 50m from the sandbath known for its excellent seafood dinners (included in the price, which is fairly cheap even.) The woman working there (probably the owner’s wife) spoke about as much English as I speak Japanese but we managed to communicate well enough anyway and she made me feel welcome. There were 3 other Japanese guys about my age staying there, and nobody else. I’m now back on the train, which turned into a groaning, bouncing multispeed diesel at Ibusuki – they don’t even have continuously welded rails out here. Am I really still in Japan? I’m heading even further down the line to Kaimon, where there’s a mountain I want to climb. You may have heard of cat cafés – a uniquely Japanese phenomenon where you pay by the hour to visit cats in a comfortable living room-like setting. I’ve been meaning to visit one. Apparently there’s one in Kyoto but a combination of poor Internet access and train schedules prevented me from getting directions in time to visit. On Sunday I had a little train adventure. The Wakayama Electric Railway is probably the world’s most fun suburban railway. It’s a pokey little train line running from Wakayama (edge of nowhere) to Kishigawa (middle of nowhere) – about the same size as the train system that runs from Kyoto to Kurama and Kibune. The fun part is that they’re gradually renovating the 6 trainsets they purchased from the Nankai Electric Railway. I took the Tama Densha (Tama’s train) out to Kishigawa. Tama is the Station Master of the Kishigawa station – and she’s a calico cat! The train interior and exterior are really impressive, showing the beautiful, obsessive attention to detail that only Japan can do. Some examples: cat-shaped seat backs, cat-shaped lighting, and pawprints on the floor. 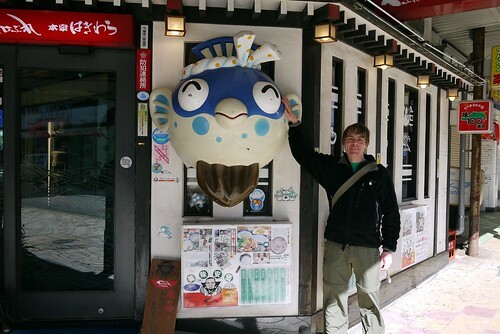 I wandered around Kishigawa for a bit, hoping to make it onto the Omoden (Toy Train) running 30 min later. The Omoden apparently has a large collection of children’s toys on shelves that you can use freely during your ride – again, something that could only work in Japan. Unfortunately, I got a bit lost in the twisty streets of Kishigawa and missed the train. Rather than wait another 2 hours, I took one of the boring, unrenovated trains back to Wakayama. We passed the Omoden going the other way and a kid in my car jumped up and down pointing at it and begging his parents to let him take the Omoden :) Maybe he just didn’t want to go to Wakayama though. There are a few wild cats living in the park around Wakayama Castle, but they’re skittish and only one of them would approach me. I took the train back to Osaka and tried yet again to find a cat café. Osaka has a few, but sadly they all close early on Sundays! So no cat café for me, yet again. Oh well. There will be other cat cafés. And adventures continue! 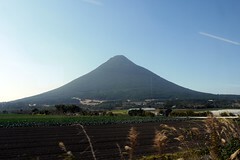 Today I’m heading to Ibusuki, the southern tip of Kyushu, via Fukuoka and Kagoshima. The trip has involved 2 types of shinkansen, a local electric train, and something I didn’t think even existed in Japan: a groaning multispeed diesel. 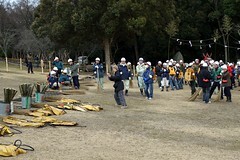 I found out that there was a fire festival on Saturday in Nara – an ancient capital of Japan close to Kyoto and Osaka. 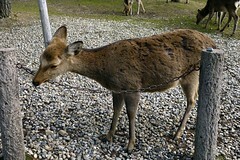 I decided to go to Nara for the day, then head to Osaka at night as originally planned. 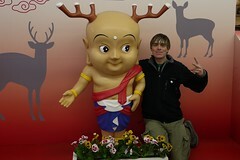 Nara is strange. 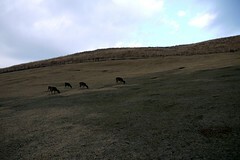 According to local legend, the god Sento rode to Nara on a deer. Or something. In any case, there are deer everywhere. They’re tame but they’ll eat your food if you’re not careful. You can buy deer crackers from street vendors if you want to make a few quick friends. Finally, it was time for Yamayaki. 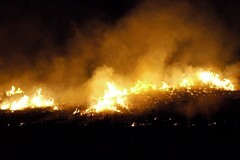 Although originally started to commemorate a military action where Wakakusa-yama (hill) was set on fire as part of a feud between monks, the event now has religious overtones. I don’t understand the Shinto religion at the best of times, so I’m not going to try and explain _why_ anything happened. I’m just going to write _what_ happened. 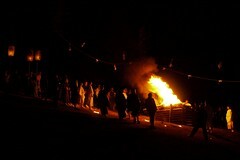 Finally, around sunset, torches were lit from the park flame and carried to a shrine built near Wakakusa-yama. 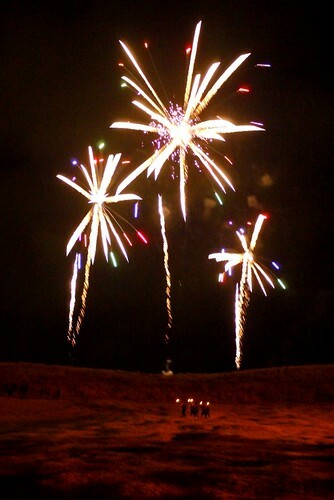 (Like most Yamakaki spectators, I watched this happen on a large projection screen at the bottom of the hill.) 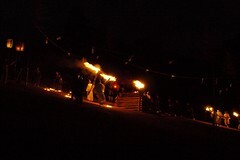 They lit a pyre at the shrine and a succession of people offered prayers (in double-clap-and-bow Shinto fashion) and added leaves to the fire. 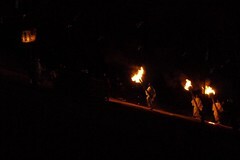 Then more torches were lit from this fire and carried to light a third pyre just past the rope keeping spectators out. 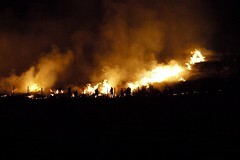 From this pyre, several groups of people lit torches and carried them to spots around the hill under a firework-lit sky. 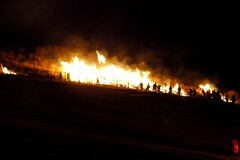 A few hundred fire rangers armed with beaters and water packs were also assembled around the hill by this time. and meanwhile everyone went home.